SANTA PAULA, CA—January 29—Drawing upon research from the educational data-analytics firm College Factual, USA Today recently proclaimed Thomas Aquinas College one of the country’s Best 10 Colleges for the Money. The “Best Colleges” ranking identifies schools that have “good outcomes for students,” such as high graduation rates and low student-loan default rates, as well as a “reasonable price tag” for the education they offer. In evaluating the total cost of attending a school, College Factual calculates an “average net price” — tuition minus scholarships and financial aid — and multiplies that amount by the average number of semesters it takes students to graduate. Most Thomas Aquinas students, College Factual reports, graduate in 4.1 years; nationally, the average is closer to five or six years. The College’s being named to USA Today’s “Best 10 Colleges for the Money” list, says Director of Admissions Jon Daly, is a reflection of its longstanding commitment to value and affordability. Thomas Aquinas College turns no student away on the basis of financial need, and it caps the amount that students are asked to borrow at $18,000 over four years. Average total debt after four years is less than half the national average of nearly $35,000. 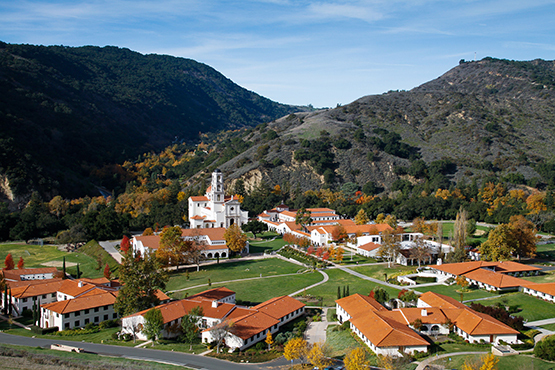 Thomas Aquinas College is a four-year, Catholic liberal arts college with a fully-integrated curriculum composed of the Great Books, the seminal works in the major disciplines by the great thinkers who have helped shape Western civilization. There are no textbooks, no lectures and no electives. Instead, under the guidance of faculty members and using only the Socratic method of dialogue in classes of no more than 20, students read and discuss the original works of authors such as Euclid, Dante, Galileo, Descartes, the American Founding Fathers, Adam Smith, Shakespeare, Copernicus, Kepler, Newton, Einstein, Aristotle, Plato, St. Augustine, and of course, St. Thomas Aquinas. Graduates consistently excel in the many world-class institutions at which they pursue graduate degrees in fields such as law, medicine, business, theology and education. They have distinguished themselves serving as lawyers, doctors, business owners, priests, military service men and women, educators, journalists and college presidents.